Synopsis: Is there a grand design behind the desperate action of the ESI authorities to facilitate a political bigwig to take over ESIC properties as running medical colleges? 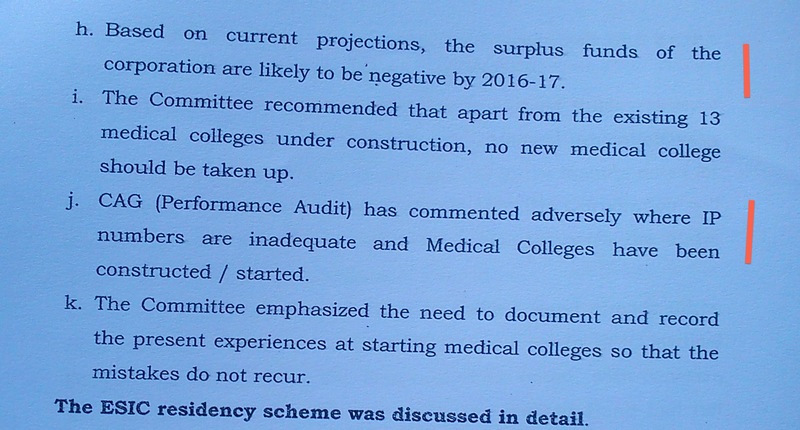 Why are they hell-bent on continuing with the medical colleges when they know that their financial position would nose dive very seriously in the year 2016-17, if they continue to run them? Why are the ESIC authorities moving the Supreme Court and High Court New Delhi so desperately to get the required certificate from the Medical Council of India which did not certify the fitness of these colleges for the year 2015-16? Are the ESIC authorities going to protect the property of the Indian labour force or are they playing active role in the conspiracy? Do the authorities have any right to keep people in the dark, by not answering legally valid questions? The article is intended to find answers. The ESI Corporation started establishing medical colleges and are running them from the year 2010 onwards in (1) K.K. Nagar, Chennai, Tamilnadu, (2) Rajaji Nagar, Bengaluru, Karnataka (3) Joka, Kolkata, West Bengal, (4), Gulbarga, Karnataka and (5) Dental College, Rohini, Delhi. 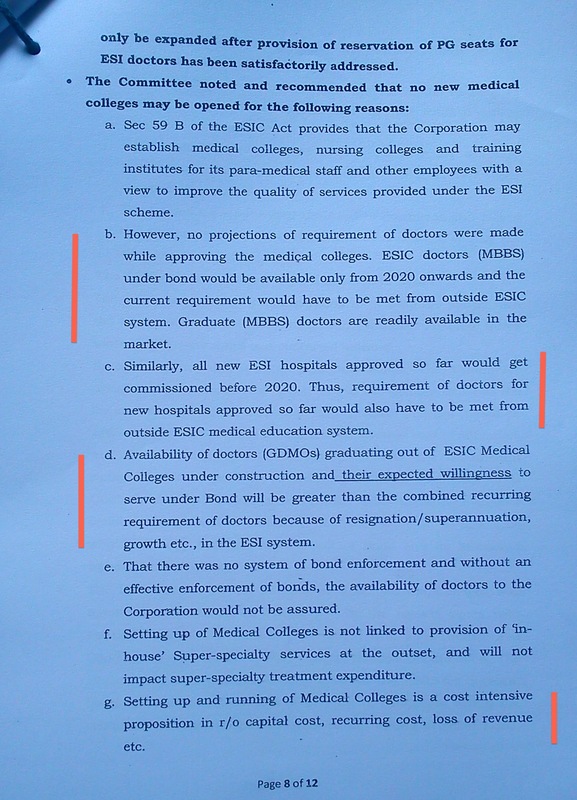 It was later realised by the ESIC, in the year 2014, that it had ‘no core competency to run medical colleges’. A Sub-Committee was, therefore, constituted to examine the issues involved. The Secretary of the Ministry of Labour & Employment, Government of India had been the Chairman of that Sub-Committee on Medical Services and Medical Education. The Director General of the ESI Corporation had been one of the Members along with the Financial Commissioner of the ESI Corporation. And, that Committee had given report on 13.05.2014 stating, among many, that based on current projections, the budget of the ESIC would likely be negative in the year 2016-17. The authorities had, therefore, informed the Hon’ble Prime Minister, in a meeting held on 05.07.2014, that “since the ESI Corporation did not have the core competency to run medical colleges, they may be handed over to relevant agencies with capability and mandate to run medical colleges”. 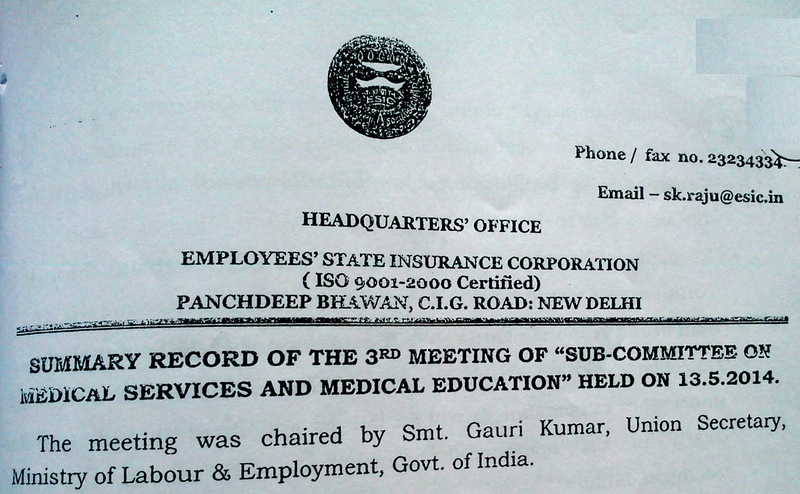 The Apex decision-making body, the ESI Corporation had, thereafter, taken a formal decision, on 04.12.2014, that the “ESIC should exit the field of medical education entirely” as that was “not the core function of the organization”, as could be seen from the Memo dated 05.01.2015 of the ESIC. The ESIC had also decided to ease itself out of the situation in a phased manner by running the colleges only for the purpose of enabling the already-admitted students to continue and complete their studies or to close all the colleges, at once, by apportioning the admitted students among other medical institutions. 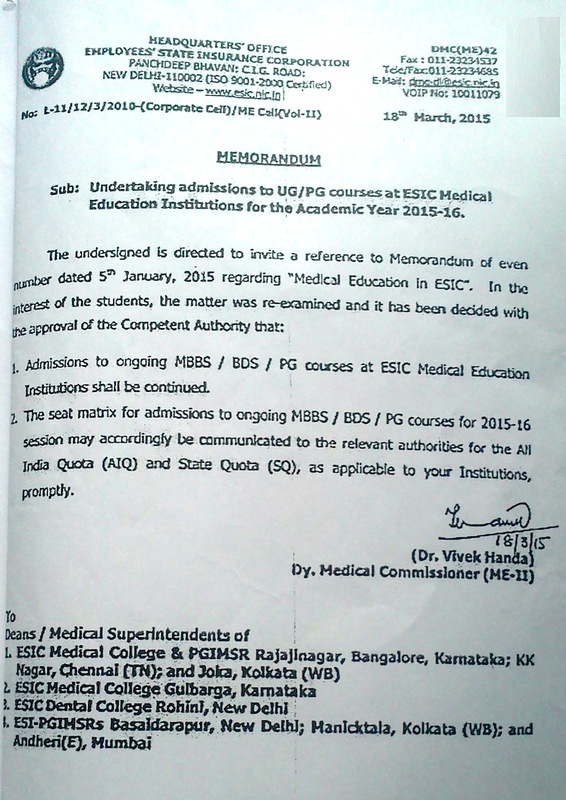 The ESIC had also decided not to undertake further admissions. It has been specified in the aforesaid Memo dated 05.01.2015 that the “ESIC may neither undertake further admissions in the medical colleges and other Medical Education Institutes (PG, Nursing, Para-medical & Dental including Dental College Rohini) nor start new medical colleges”. 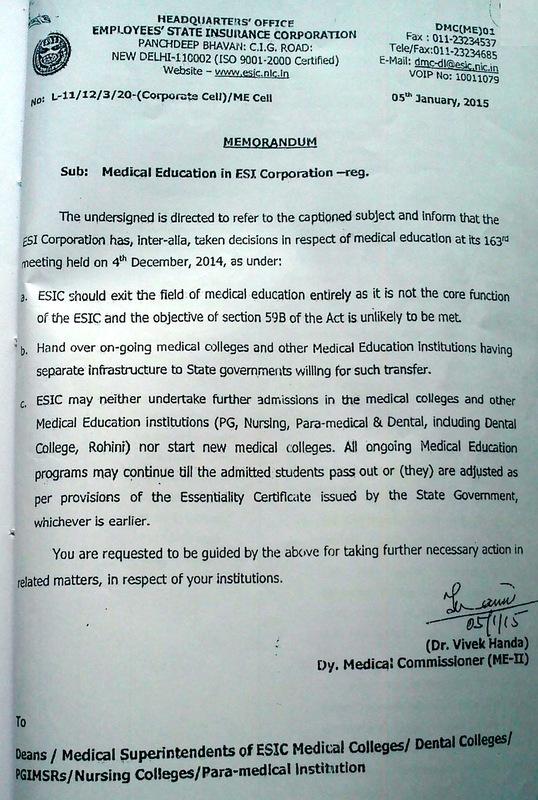 The memo revealed that the ESI Corporation had, as an Apex Body, taken a considered decision to quit medical education and to close down the medical institutions in a phased manner or to close them down immediately by apportioning the existing students among other medical colleges of the respective state governments, “whichever is earlier”. While this was the decision taken, rightly, by the Apex body on 04.12.2014 and communicated on 05.01.2015, the ESIC authorities had, in their subsequent Memo. dated 18.03.2015, communicated a diametrically opposite administrative decision (and that too, without placing that issue before the aforesaid Apex Body) to admit students for MBBS/BDS/PG courses in all the aforesaid four institutions for the year 2015-16. When the ESIC had confessed earlier, in categorical and clear terms, that it did not have the core competency to run the medical colleges and that running medical colleges was not its core activity, it cannot, later, take an arbitrary and unjustified decision to admit students for one more batch and aggravate, thereby, the problems of both the organization and the prospective students. The contents of the Memo dated 18.03.2015 were really puzzling. And, rumours were afloat, that the reason for the decision communicated by the ESI authorities on 18.03.2015 to reverse the earlier decision dated 05.01.2015 was to facilitate handing over the four medical colleges at the four metros with the entire infrastructure to some, already-identified-political-bigwig, at a later date, as a running institution. The rumour gained credibility as the decision communicated on 18.03.2015 had been taken without recording convincing reasons anywhere to prove how the issues raised by the Sub-Committee were wrong or, at least, surmountable. Was it not the duty of the bureaucrats to record reason rebutting all the points raised by the Sub-Committee that led to the decision to quit medical education? A citizen had, therefore, decided to ascertain for himself the facts relevant to the issue. He wanted to know whether the ESIC, which had taken decision to admit students for the next year would continue to run the medical colleges “forever” or would hand over those colleges, at a later date, to someone through some arrangements, as the authorities have already been demonstrating considerable enthusiasm (over-enthusiasm, in fact) in PPP very often. Kindly intimate whether it has been recorded anywhere in the records of the Hqrs. Office of the ESI Corporation that these five institutions would continue to be run by the ESI Corporation forever. Kindly intimate whether any analysis of the financial implications in running these five institutions for another, at least, five or six years (until the students who join complete the courses) had been made on the file before issuing the instruction in the above-mentioned Memo dated 18.03.2015. Kindly intimate whether the concurrence of the Financial Commissioner of the ESI Corporation had been obtained on file for such calculations regarding the running cost. Kindly intimate whether the ESIC will, again, express its inability to run the medical institutions and try to hand over these five institutions to anybody, at a later date. But, the CPIO of the Headquarters Office of the ESI Corporation maintains total silence and does not respond to the application. He is violating the provisions of law, in the belief that the penal provisions of the RTI Act would not be enforced. But, the public has the right to draw adverse inference when a public authority does not discharge his legal duty to respond and maintains total silence. “Information is Power”, said Robin Morgan. But, the Indian bureaucrats believe that “Suppression of information means more Power”. But, their unlawful non-response lends credence to the rumours that they are abetting the process of handing over the four important structures in the four metros at Delhi, Bengaluru, Chennai and Kolkata, really, to the private bigwig at a not-so-distant future, as running institutions. NB: The Medical Council of India denied permission to the ESIC to admit students in the ESIC run medical institutions at Kolkata (Joka), Chennai (K.K. Nagar), Bengaluru (Rajaji Nagar) and Gulbarga (Kalaburagi). 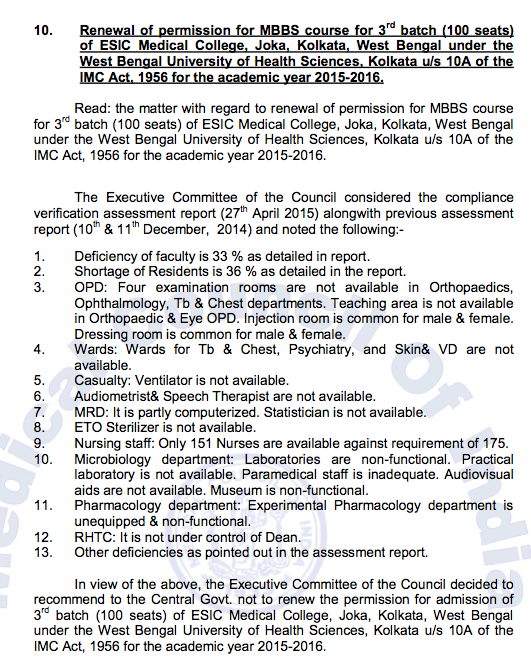 MCI report on Joka ESIC Medical College. The latest news is that the ESIC authorities have gone to Supreme Court and then to the High Court of New Delhi seeking direction to the Medical Council of India to reconsider its earlier decision not to recommend issuing Letter of Permission to run the ESIC Medical Colleges. Why are the authorities so desperate to run the ESIC medical colleges in spite of clear cut red-signals seen by them ahead? Why are they so desperate to consciously go the wrong way, which, they are aware, is wrong? Is this desperation of the ESIC authorities in the interest of the insured persons? Huge amount of money has already been invested in these medical college project and in most case disproportionate to the actual need of a public fund medical college and hospital. Two issues need to be considered at the highest government level (1) the obvious corrupt motive in the said decision and to pin point the authorities responsible for it and take action. Where decision is taken without statutory authority and power and where the amount sanctioned and method of sanction is disproportionate to the need and the method is in clear violation of extant instruction and CVC guidelines, the corrupt practice is inferred. (2) How to ensure the the money spend is not wasted or not gifted out to private players and how to run these institution in public sector while ESIC getting minimum compensation for the money spend by them. I feel Government of India, under Ministry of Health should take them over directly and complete the project and run them as Central medical colleges like PGI, Moulana Azad etc and some at par with AIIMS and provide certain bed reservation free or at minimum cost to ESIC and allow some seats to be funded by ESIC in return for Bond for servicing ESIC. ESIC in any case will find it very difficult to run medical college where they are afraid to take over and run even primary medical care for ESI patients in States. There is acute shortage of medical faculty and let us admit, ESIC has a poor reputation for medical personnel. The only remedy is for Central govt to step in and ensure that at least over a long period of time ESIC is compensated for its investment by having some student under Bond and getting reserve facilities for IPs. The Officer corps in ESIC is not competent to rise to that high level of decision making as over a period of time, they have learnt to not down the instruction of the boss on deputation and then covert them into file. The decision need to come from the highest level of Govt.